The sequel to the SNES smash Zelda : A Link to the Past (ALTTP) ; A Link Between Worlds was on show to play at this years Eurogamer Expo. It is a chronological sequel to ALTTP based in the same world. This will be the first original Zelda title for the 3DS, as Ocarina of Time was a remake of the N64 classic. 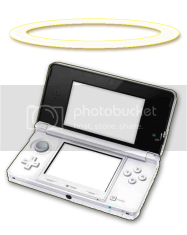 We at 3DSBlessed did not miss the chance to have a try out this sequel. The playable demo gives the player two choices: to start in the field or go straight to the dungeon. 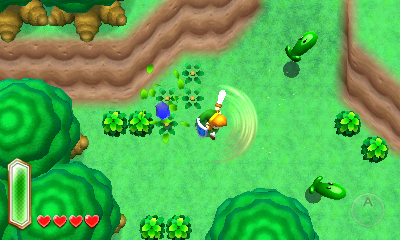 If you choose the field ; the playscape starts out as in that classic Hyrulian style of green grass, cliffs and small monsters scattered around, bringing back nostalgia to A Link to the Past players albeit with improved graphics and 3D effects. It’s worth pointing out that it has been a while since a top-down-view Zelda game has been released (this style was last seen with the Phantom Hourglass/Spirit Tracks games for the Nintendo DS. Apart from the boat and train segments ofcourse). None the less this will be a welcome addition to mix in with the latest features of the 3DS. The weapons you start out with are the classic attire such as a sword, shield, bow and a interesting one which is a magic hammer you can use to bash moles (which you may then walk over and use as a springboard to get to higher ground). The bottom screen will be used for accessing the map, gear and items/rupees. Link can defend himself with his shield by holding the R button, attack with his sword with B button (which also fires beams of energy when at full health), and also assign items to the X and Y buttons. The dungeon segment is where this game really shows its magic and how it takes advantage of the 3DS graphical capabilities. The 3D really adds depth to the game, especially in places like the dungeon where you bounce from one floor to another. In addition the boss battles look amazing in 3D. 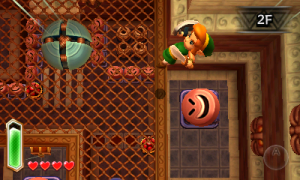 One of the new features is that Link can now merge with the walls to become a painting and move along them to other platforms and holes/cracks. This can be useful to solve puzzles. However ; it does take up his stamina, so use wisely. Another addition is the ability to “rent” weapons from a shop owned by a character called Ravio (which you will be able to purchase to keep later on in the game). Players will also be able to choose the order they complete the dungeons in, so for veterans it will be tempting to try the hardest dungeons from the start. A Link Between Worlds provides modern twists whilst keeping with the classic gaming formula and is, hence, a very good mix of both new and old. A definite must-have for Zelda fans and 3DS gamers in general. 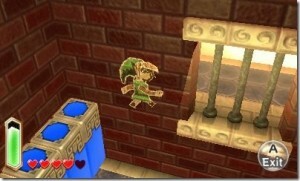 Zelda: A Link Between Worlds will be released exclusively on the Nintendo 3DS in November 22 2013 in Europe. Definitely a must have? Count me in. Can’t wait for this. Although I hope doing the dungeons in any order you want doesn’t make it so that there’s different game endings or something like that; one ending is enough for Zelda if you ask me.